Rambling around my Life: Accuracy, three points and seam allowance. Accuracy, three points and seam allowance. 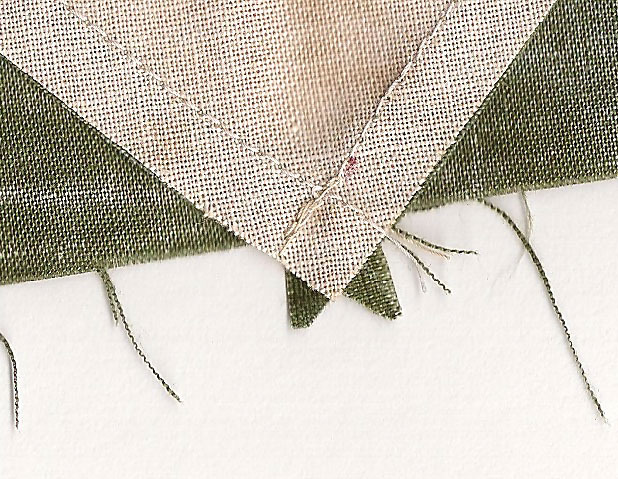 Accuracy in cutting and stitching is vital. I've been told that over and over again and I respect that. But every now and then you start to think that there's something funny going on. After all my care why doesn't my square turn out the way it should. Take 4 Texas Tears from Civil War Quilts by Barbara Brackman. I've been cutting from that pattern at the moment. Usually it's a 1/4" seam allowance and that's what I've been using. This shows the back of the spot where three triangles join, The little points are sticking out in just the right place. Now if I use another 1/4" seam allowance to join this nice straight edge to another piece of fabric then I am going to nip off the point of the centre triangle, because where those two lines of stitching cross is less than 1/4" from the cut edge for the seam. This diagram shows the small square at the back where the three triangles meet, a square with sides of 1/4". Calculate the length of the diagonal of this square. 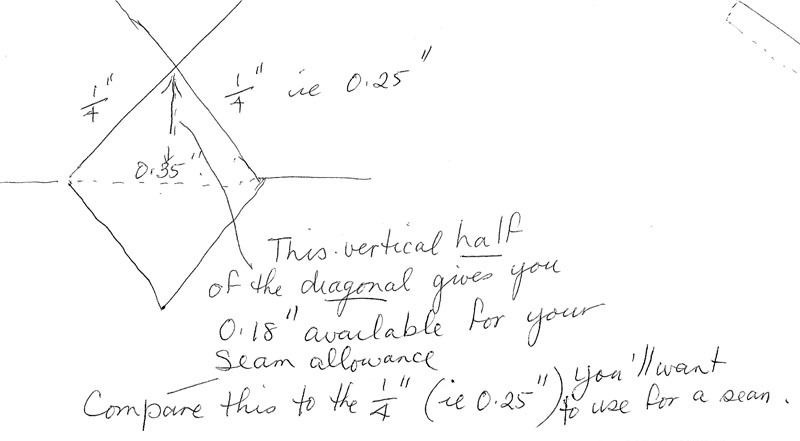 Then half the length of the diagonal is the amount of fabric you have available for a seam allowance. 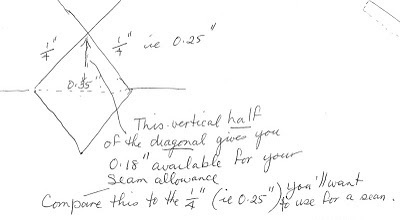 It's much less than the 1/4" that you want to use. I hope you can follow my maths. Think of Pythagoras Theorem in Maths at school. Perhaps I've been reading the wrong books but I can't find any reference to it in the articles on joining points. So what am I meant to do. Fudge it ? That's not exactly being accurate !